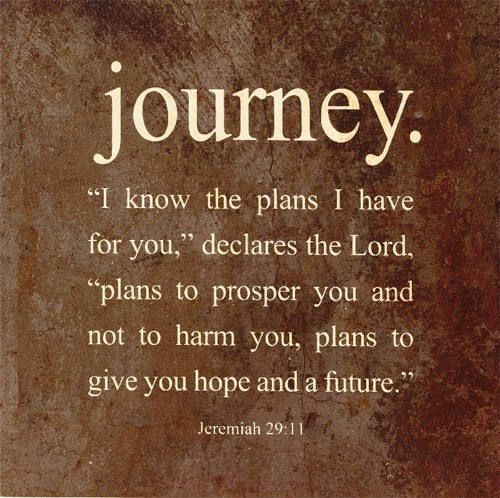 "Your journey has molded you for your greater good, and it was exactly what it needed to be. Don't think that you've lost time. It took each an every situation you have encountered to bring you to the now. And now is right on time." I saw this quote recently and it really caught my attention; especially right now. And it really reflects how I feel. Sometimes our lives can be so difficult and challenging, it often leaves us wondering if we're on the right path or not. It's filled with terrific highs and lows; ups and downs; twists and turns; valleys and mountains; tragedies and triumphs. And sometimes it seems our dreams get smashed under the weight of life itself. But the longer I journey through life, the more I see it is just that ~ a journey. Sometimes the journey is beautiful, sometimes it's messy, and sometimes its a beautiful mess. Yet as a believer, as a disciple of Jesus, I know life is not merely happenstance. We've been given the gift of choice. We choose how to live our lives. We make decisions everyday. Still, at the end of the day, I believe there is a God in Heaven who is ultimately in charge; who leads and orchestrates the plans He has for our lives. I believe all those moments in life that seem coincidental really aren't; they're pointing us in a certain direction. I believe we each were created for a specific reason; that we have a unique God-given purpose and destiny to fulfill. I believe He weaves it all together through Christ and His order. And I believe there are those wonderful times that we get a glimpse of it all. Now I don't know about you, but those sweet little glimpses help me keep going! I once heard it said that the two most important days in our lives are the day we were born and the day we find out what we were born for. There is so much truth to that statement! Yet oftentimes getting there is a long, challenging process and our life experiences can shape the process itself (I personally believe the best way to come into that understanding is to come into relationship with the One who created us). But no matter what, I believe our experiences in life are never wasted. And I'm not just giving lip service to this. I really do believe that for myself as well. Whether they be good or bad, fair or unfair, expected or unexpected, I believe our experiences can ultimately help us become who we were created to be and point us in the direction we need to go. If we let them. And I also believe as we seek Him along the way, the Lord will give us direction and assurance through the Holy Spirit. However, I've learned that doesn't automatically mean it will be easy or simple. In fact, it usually isn't. The powers that be always try to fight what God is doing. But regardless of the setbacks, oppositions, or hardships we might encounter, we can know, just as David penned in Psalm 23, that "He leads me beside still waters" (waters of peace and rest) and "He guides me in paths of righteousness for His names sake" (the right paths that honor who He is). In the end, you can trust that He will lead you right where you need to be. And that means you can trust you'll also be right on time. Beautiful once again. Thanks Michelle....I have read this tiwce and find it a blessing each time. Hugs to you. Thank you, Renee. Hugs right back to you. Can I post on my facebook ! Hi there, Anonymous. Yes you may post this to your fb wall. All I ask is that you link it back here to my blog. There's a Facebook share button in the tags section just above here that allows you to post this directly to your own wall.